A Report released on Monday by Access Living finds that only 62 percent of the 186 paratransit pick-ups recorded through multiple surveys around Chicago were on-time. In contrast, Pace, which administers the paratransit program in Chicago, generally reports an on-time pick-up performance rate of 87.5 percent. The surveys also found that when pick-ups were late, they were often very late. Forty-one percent of late pick-ups were over 40 minutes late. Sixteen percent were over an hour late. Paratransit is the public transportation system for people whose disabilities make it too difficult for them to ride conventional public transportation. To use the system, paratransit riders schedule pick-ups 24 hours in advance of a trip, and arrange a specific pick-up time with the paratransit carrier. Pace considers a pick-up to be on-time if it occurs within 20 minutes of the scheduled pick-up time. Concurrent with the release of this Report, a coalition of organizations filed a complaint with the Federal Transit Administration (“FTA”). 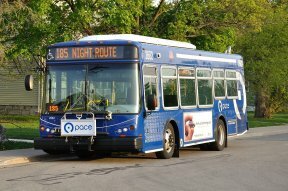 The complaint alleges that Pace’s on-time performance is so low that it violates the Americans with Disabilities Act. To fix this problem, the complaint asks the FTA to demand that Pace: (a) track pick-up times via its GPS capability, (b) enforce penalty clauses already in its contracts for late pick-ups, and (c) appoint an independent auditor to both uncover the reasons for the low on-time performance rate and propose action steps for improvement. “This is about our basic civil rights,” said Dr. Ayo Maat, President of IMPRUVE, a paratransit advocacy group. “We can’t participate in society, hold down a job, or even get regular medical care if we don’t have reasonably reliable transportation. 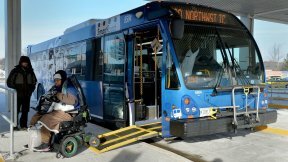 Chicago’s paratransit system isn’t reliable enough to meet those needs.” The coalition supporting the filing of the FTA complaint consists of the Advocacy Group at Friedman Place, Access Living, Chicago ADAPT, the Chicago Rider-Driver Alliance, Equip for Equality and IMPRUVE. A copy of the Report is posted on Access Living’s website, and can be found here. For more information, contact Charles Petrof, Access Living, at 312.640.2124 (voice), 312.640.2169 (tty), cpetrof@accessliving.org (email).